© Shea and Tager; Licensee Bentham Open. 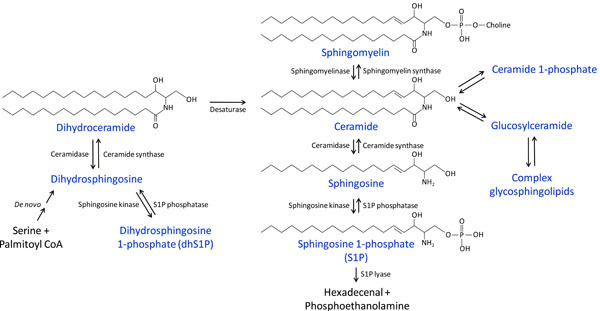 Bioactive sphingolipids, such as sphingosine 1-phosphate (S1P), dihydrosphingosine 1-phosphate (dhS1P) and ceramide, regulate a diverse array of cellular processes. Many of these processes are important components of wound-healing responses to tissue injury, including cellular apoptosis, vascular leak, fibroblast migration, and TGF-β signaling. Since over-exuberant or aberrant wound-healing responses to repetitive injury have been implicated in the pathogenesis of tissue fibrosis, these signaling sphingolipids have the potential to influence the development and progression of fibrotic diseases. Here we review accumulating in vitro and in vivo data indicating that these lipid mediators can in fact influence fibrogenesis in numerous organ systems, including the lungs, skin, liver, heart, and eye. Targeting these lipids, their receptors, or the enzymes involved in their metabolism consequently now appears to hold great promise for the development of novel therapies for fibrotic diseases. The response to tissue injury involves a complex series of biological responses which, if appropriate in timing, magnitude and balance, restore normal tissue structure and function. When dysregulated or over-exuberant, however, these responses can result in fibrosis, characterized by the pathological accumulation of fibroblasts and myofibroblasts, and the extracellular matrix that they synthesize. Fibrosis is frequently observed following injury to the lungs, skin, liver, heart, and eye. In many fibrotic diseases, such as idiopathic pulmonary fibrosis (IPF) and systemic sclerosis (SSc), the replacement of normal tissue with fibrosis is progressive and unrelenting, eventually leading to end-stage organ dysfunction and death [1,2]. Since tissue fibrosis may be difficult to reverse once established, strategies aimed at preventing fibrosis by interrupting the upstream biological processes that contribute to fibrogenesis are likely to have the greatest therapeutic impact. Sphingolipids were originally identified as structural components of biological membranes. Many of them, most notably sphingosine 1-phosphate (S1P) and ceramide, are also now recognized to be important mediators of many basic cellular processes involved in tissue responses to injury, such as cell migration, survival, contraction, proliferation, gene expression, and cell-cell interactions [3-5]. By virtue of their ability to regulate these processes, there has been substantial recent interest in the ability of sphingolipids, particularly S1P, to regulate tissue fibrosis in various organ systems. S1P exerts its cellular effects predominantly through interactions with a family of specific cell surface G protein-coupled receptors, labeled S1P1-5 [3,6]. Especially relevant to wound healing and fibrotic responses to tissue injury, S1P signaling through its receptors has been shown to regulate epithelial cell apoptosis, fibroblast migration and myofibroblast differentiation, vascular permeability, and TGF-β signaling in vitro [7-12]. Furthermore, numerous recent studies have suggested important roles for S1P in the development of fibrosis in the lungs, skin, liver, heart and eye, and alterations in circulating S1P levels have been observed in various human diseases characterized by tissue fibrosis [13-19]. In this review we discuss the current literature implicating sphingolipid signaling in the regulation of fibrogenesis in multiple organs (Table 1). We focus predominantly on S1P, but discuss evidence that ceramide and dihydrosphingosine 1-phosphate (dhS1P) regulate fibrogenesis as well. Sphingolipids are a class of complex, structurally-related compounds derived from sphingoid bases, with hundreds of known class members. The first sphingoid base characterized, and the most common in mammalian organisms, is sphingosine [20,21]. The enzymatically catalyzed pathways through which sphingosine and many of the most commonly studied signaling sphingolipids, including S1P, dhSIP, and ceramide, are converted into each other are depicted in Fig. (1). Given the pleiotropic effects of these sphingolipids on physiological and pathological cellular functions, altering their levels by targeting the enzymes involved in their metabolism holds great therapeutic potential for human diseases. Ceramide is at the center of these metabolic pathways (Fig. 1). It can be generated de novo from serine and palmitoyl-CoA through several intermediate steps, the last of which is the desaturation of dihydroceramide. Ceramide alternatively can be formed from the catabolism of sphingomyelin by sphingomyelinases (SMase) or the breakdown of complex glycosphingolipids. Conversely, ceramide can be converted back to sphingomyelin by the addition of a phosphocholine group by sphingomyelin synthases. Ceramide can be phosphorylated to ceramide 1-phosphate by ceramide kinase, or it can be glycosylated by glucosyl- or galactosylceramide synthases. Ceramide can also be metabolized by ceramidases to form sphingosine, which can in turn be phosphorylated by sphingosine kinases (Sphk), producing S1P. S1P can either be converted back to sphingosine by the action of S1P phosphatases or lipid phosphate phosphatases (LPPs) , or it can be degraded by S1P lyase. Similar enzymatic pathways catalyze the interconversion of dihydroceramide, dihdydrosphingosine, and dihydrosphingosine 1-phosphate (dhS1P), as also shown in Fig. (1). Devastating fibrotic lung diseases such as IPF may result from over-exuberant wound-healing responses to common insults to the lung, such as from inhaled particulates, viral infections, or aspiration of refluxed gastric acid [23-25]. Biological responses to injury which, if dysregulated, may contribute to the development of these diseases include: 1) epithelial cell death/apoptosis, 2) increased vascular permeability, 3) inflammatory cell recruitment, 4) extravascular coagulation, 5) activation of transforming growth factor-β (TGF-β) and other pro-fibrotic mediators, 6) fibroblast recruitment, proliferation, persistence and activation to myofibroblasts, and 7) synthesis of collagen and other extracellular matrix proteins [26-29]. Better understanding of the molecular mediators and pathways that regulate these aberrant wound-healing responses should therefore lead to novel therapeutic targets for fibrotic diseases. In support of this approach, multiple investigations in animal models of lung fibrosis have demonstrated that targeting one or more of these wound-healing responses can prevent the development of fibrosis, and in some cases reverse established fibrosis [30-36]. Recent data indicates that S1P, signaling through the S1P1 receptor, plays a key role in regulating the development of fibrosis after lung injury. We demonstrated that inhibition of S1P-S1P1 signaling resulted in increased pulmonary fibrosis in the bleomycin mouse model of this disease, indicating that this pathway functions in the lung as an endogenous inhibitor of fibrogenesis . While there are numerous potential mechanisms to explain the anti-fibrotic effect of S1P-S1P1 signaling, we hypothesize that it is largely due to the ability of this pathway to attenuate vascular leak after lung injury. S1P has been established as a key regulator of vascular permeability, and it limits the vascular leak characteristic of the early, exudative response to lung injury. S1P’s ability to regulate vascular permeability in the lung appears to be attributable to signaling specifically through S1P1. Activation of S1P1 on endothelial cells by S1P or S1P1 agonists induces cytoskeletal rearrangements which promote formation of intercellular adherens and tight junctions, resulting in enhancement of endothelial barrier function [8,37-41]. Mice which are genetically deficient for the S1P-producing enzyme sphingosine kinase 1 (Sphk1) develop increased vascular leak after lung injury [42,43]. Genetic deletion of both sphingosine kinases (Sphk1 and Sphk2) results in a complete lack of circulating S1P and increased vascular leak in multiple organ systems, even in the absence of tissue injury . Interrupting S1P-S1P1 signaling with receptor antagonists, or with S1P analogs that act as functional antagonists of S1P1 with sustained administration, similarly increases vascular leak [13,45]. Conversely, short-term treatment with S1P or S1P1 receptor agonists has been shown to prevent vascular leak in numerous animal models of acute lung injury, as well as models of renal and cutaneous injury [39,41,45-51]. Vascular leak is one of the hallmarks of tissue injury, and it contributes significantly to organ dysfunction [52,53]. In the lung, persistent vascular leak may also contribute to the subsequent development of lung fibrosis. Increased lung capillary-alveolar permeability has been demonstrated to be present in the lungs of IPF patients and to predict worse outcomes [54,55]. One consequence of increased vascular permeability in the lungs is extravasation of clotting factors into the airspaces, where exposure to tissue factor in injured alveoli can initiate the coagulation cascade. There are extensive data indicating that activation of the coagulation cascade is a critical component of the fibrotic response to lung injury [30,32,33,56-63]. The resulting deposition of fibrin is thought to provide a provisional matrix through which fibroblasts migrate during tissue repair . Fibrin in the airspaces may also promote epithelial-to-mesenchymal transition, further contributing to fibroblast accumulation . If excessive or excessively persistent following injury, fibrin deposition consequently may contribute to the development of fibrosis . Fibrin deposition is not absolutely required for the development of fibrosis [59,66], however, and extravascular activation of the coagulation cascade may contribute to fibrogenesis through other mechanisms. In addition to their role in the generation of fibrin, thrombin and other coagulation cascade proteinases also activate a family of cell-surface receptors, the proteinase-activated receptors (PARs). Activation of these receptors may promote fibrosis independently of fibrin generation, through the induction of mediators such as PDGF, CTGF and MCP-1/CCL2 or through the activation of latent TGF-β [33,63,67]. S1P-S1P1signaling may therefore attenuate the development of fibrosis after lung injury by limiting vascular leak and the accompanying extravasation of coagulation proteinases into the injured airspaces. In vitro studies have shown that S1P is capable of mediating other processes which may contribute to the development of lung fibrosis, although some of these studies have produced conflicting data. For example, S1P has been shown to both potentiate and inhibit fibroblast chemotaxis [9,68-70]. S1P has also been shown to have cell-specific effects on apoptosis, either inducing apoptosis or promoting survival in different cell types [11,12,71,72]. S1P could therefore potentially contribute to the increased epithelial cell apoptosis and decreased fibroblast apoptosis observed in lung fibrosis . Lastly, S1P has been shown to play a role in TGF-β-induced differentiation of fibroblasts into myofibroblasts in vitro, another process critically involved in fibrogenesis [10,74,75]. Further evidence that sphingolipids may regulate the development of lung fibrosis comes from recent findings that activity of the sphingomyelin-degrading enzyme acid sphingomyelinase (ASM) is increased in the lungs of mice after intratracheal bleomycin challenge, and that mice genetically deficient for this enzyme exhibit attenuated lung fibrosis in this model . Interestingly, despite the increased lung ASM activity seen in wild-type mice, lung ceramide levels actually decreased after bleomycin challenge, which may have been due to the simultaneous upregulation of the ceramide-degrading enzyme, acid ceramidase . Sphingolipids have also been implicated in the pathogenesis of systemic sclerosis (SSc). SSc, or scleroderma, is an autoimmune connective tissue disease characterized by widespread vasculopathy and tissue fibrosis . Although the hallmark of this disease is progressive thickening and fibrosis of the skin, fibrosis in SSc can involve many different organ systems, including the lungs, heart, kidneys, and digestive tract . Like IPF, SSc is a progressive and often fatal disorder. Although there is an inflammatory component to the pathological changes seen in SSc, again similar to IPF it is largely refractory to conventional anti-inflammatory and immunosuppressive medications . TGF-β and its signaling pathways are thought to play a central role in the fibrogenesis seen in SSc . Numerous studies have shown that sphingolipids, most notably S1P and dhS1P, can regulate TGF-β signaling pathways in skin cells in vitro, and there are recent data implicating altered sphingolipid signaling in the pathogenesis of human SSc. In contrast to the role that S1P appears to play limiting the development of pulmonary fibrosis, S1P may promote the development of dermal fibrosis in SSc. S1P has been shown to induce activation of the canonical TGF-β signaling pathway in numerous cell types, including skin fibroblasts [78-81]. Specifically, S1P has been shown to induce phosphorylation of Smad2 and Smad3 and upregulate expression of Smad-dependent genes. This process appears to be independent of TGF-β itself, but dependent on the S1P receptors, suggesting that there is crosstalk between the S1P and TGF-β signaling pathways. S1P1, S1P2 and S1P3 have all been implicated in TGF-β signaling pathway activation by S1P, and the specific receptor(s) involved are likely cell type-dependent. Further support for S1P playing a pro-fibrotic role in SSc comes from recent data showing that S1P levels are increased in the serum of SSc patients compared with matched controls . Moreover, since S1P is known to regulate immunity and endothelial cell function, it may also play central roles in the autoimmune and vascular manifestations of SSc . Dihydrosphingosine 1-phosphate (dhS1P), which is also produced by sphigonsine kinase and binds to the S1P receptors (Fig. 1), has been shown to have opposing effects to those of S1P on TGF-β signaling in skin fibroblasts, and may therefore limit the development of dermal fibrosis . dhS1P inhibits TGF-β-mediated Smad2 and 3 phosphorylat-ion and collagen synthesis in a manner dependent on PTEN, a tumor suppressor gene which has anti-fibrotic properties . dhS1P promotes formation of a PTEN-Smad2/3 complex, which results in the dephosphorylation of Smad2 and Smad3 and reduced expression of Smad-dependent genes . Reduced PTEN expression has been found in skin fibroblasts isolated from SSc patients, as well as in myofibroblasts in lung sections from IPF patients [14,83]. Whereas treatment of SSc fibroblasts with S1P resulted in further reduction of PTEN levels and increased collagen I production, treatment with dhS1P restored PTEN levels to normal and inhibited collagen synthesis . The critical role that sphingolipids play in regulating tissue fibrosis does not appear to be limited to the lung and skin, as these signaling lipids have been implicated in liver, cardiac, and retinal fibrosis as well. S1P has been shown to be pro-fibrotic in two different mouse models of liver fibrosis. In carbon tetrachloride (CCl4)-induced liver fibrosis, S1P signaling through S1P2 appeared to promote fibrosis by mediating the accumulation of matrix-producing hepatic stellate cells and/or myofibroblasts . In cholestasis-induced liver fibrosis, S1P levels and S1P3 receptor expression were found to be elevated in the liver, and pharmacological inhibition of S1P3 attenuated the development of fibrosis in this model . Attenuation of fibrosis by S1P3 inhibition in the cholestasis model was attributed to decreased S1P3-dependent homing of pro-fibrotic, bone marrow-derived stem cells to the liver after injury. S1P has also been shown to have effects on hepatic stellate cell and myofibroblast survival, proliferation, migration and activation in vitro [85-88]. Lastly, alterations in circulating and liver S1P levels and S1P receptor expression patterns have been found in humans with liver fibrosis [19,87]. Ceramide has also been investigated as a potential regulator of liver fibrosis. Ceramide has been shown to mediate hepatocellular apoptosis [89,90], and inhibition of acid sphingomyelinase (ASM) has been shown to reduce liver ceramide levels and attenuate liver fibrosis in a rat model of Wilson’s disease . ASM haploinsufficient mice have also been shown to be protected from the development of liver fibrosis in both cholestasis- and CCl4-induced models of this disease . Lastly, ASM activity has been found to be elevated in the blood of humans with Wilson’s disease, and ASM expression has been found to be elevated in the livers of patients with nonalcoholic steatohepatitis (NASH) [91,92]. In addition to its pro-fibrotic effects noted in the liver, S1P-S1P3 signaling has also been found to promote fibrosis in the heart. Mice which overexpress the S1P-producing enzyme, sphingosine kinase 1 (Sphk1), develop spontaneous cardiac fibrosis. The ability of Sphk1 overexpression to produce cardiac fibrosis was attenuated when these mice were crossed to S1P3-deficient mice, suggesting that S1P’s pro-fibrotic effects in the heart are mediated at least in part by S1P3 . S1P-S1P2 signaling has also been shown to induce myofibroblast differentiation and increased collagen production in rat cardiac fibroblasts . Finally, pro-fibrotic activity of S1P has also been observed in the eye. S1P stimulates retinal pigmented epithelial (RPE) cell proliferation, myofibroblast differentiation, and collagen synthesis, and anti-S1P neutralizing antibodies were shown to protect against the development of subretinal fibrosis [17,93]. Sphingolipids, such as S1P, dhS1P, and ceramide play key roles in regulating numerous cellular processes, many of which have been implicated both in physiological wound-healing responses and the pathological wound-healing responses thought to contribute to multiple fibrotic diseases. As discussed above, there are accumulating data that sphingolipids play important roles in regulating the development of tissue fibrosis in numerous organ systems, including the lungs, skin, liver, heart, and eye (Table 1). In the lung, S1P signaling through S1P1 appears to protect against the development of fibrosis, likely through to its ability to limit vascular leak during the early, exudative response to lung injury. Conversely, S1P appears to promote fibrosis in other organ systems, likely through activation of TGF-β signaling pathways and/or by promoting fibroblast migration. Interestingly, dhS1P, which also signals through the S1P receptors, appears to oppose the pro-fibrotic effects of S1P in the skin. Lastly, data obtained from pharmacologic or genetic manipulation of acid sphingomyelinase (ASM) suggest that ceramide may also regulate fibrosis in the lungs and liver. Although further study is needed to better elucidate the mechanisms and specific pathways involved in the pro- and anti-fibrotic effects of these and other related sphingolipids, it is becoming increasingly clear that targeting these lipids, their receptors, or the enzymes involved in their metabolism holds great promise for the development of much-needed therapies for fibrotic diseases. This work was supported by NIH K08 HL105656 to B.S.S, and NIH R01 HL108975, NIH R01 HL095732, a Scleroderma Research Foundation Grant, and a Nirenberg Center for Advanced Lung Disease Grant to A.M.T. Ley B, Collard HR, King TE Jr. Clinical course and prediction of survival in idiopathic pulmonary fibrosis Am J Respir Crit Care Med 2010; 183(4): 431-0. Varga J, Abraham D. Systemic sclerosis: a prototypic multisystem fibrotic disorder J Clin Invest 2007; 117(3): 557-67. Hannun YA, Obeid LM. Principles of bioactive lipid signalling: lessons from sphingolipids Nat Rev 2008; 9(2): 139-50. Ishii I, Fukushima N, Ye X, Chun J. Lysophospholipid receptors: signaling and biology Annu Rev Biochem 2004; 73: 321-54. Rivera R, Chun J. Biological effects of lysophospholipids Rev Physiol Biochem Pharmacol 2008; 160: 25-46. Chun J, Hla T, Lynch KR, Spiegel S, Moolenaar WH. International Union of Basic and Clinical Pharmacology. LXXVIII. Lysophospholipid receptor nomenclature Pharmacol Rev 2010; 62(4): 579-87. Watterson KR, Lanning DA, Diegelmann RF, Spiegel S. Regulation of fibroblast functions by lysophospholipid mediators: potential roles in wound healing Wound Repair Regen 2007; 15(5): 607-16. Garcia JG, Liu F, Verin AD, et al. Sphingosine 1-phosphate promotes endothelial cell barrier integrity by Edg-dependent cytoskeletal rearrangement J Clin Invest 2001; 108(5): 689-701. Goparaju SK, Jolly PS, Watterson KR, et al. The S1P2 receptor negatively regulates platelet-derived growth factor-induced motility and proliferation Mol Cell Biol 2005; 25(10): 4237-9. Keller CD, Rivera Gil P, Tolle M, et al. Immunomodulator FTY720 induces myofibroblast differentiation via the lysophospholipid receptor S1P3 and Smad3 signaling Am J Pathol 2007; 170(1): 281-92. Hagen N, Van Veldhoven PP, Proia RL, Park H, Merrill AH Jr, van Echten-Deckert G. Subcellular origin of sphingosine 1-phosphate is essential for its toxic effect in lyase-deficient neurons J Biol Chem 2009; 284(17): 11346-53. Imasawa T, Koike K, Ishii I, Chun J, Yatomi Y. Blockade of sphingosine 1-phosphate receptor 2 signaling attenuates streptozotocin-induced apoptosis of pancreatic beta-cells Biochem Biophys Res Commun 2010; 392(2): 207-11. Shea BS, Brooks SF, Fontaine BA, Chun J, Luster AD, Tager AM. Prolonged exposure to sphingosine 1-phosphate receptor-1 agonists exacerbates vascular leak, fibrosis, and mortality after lung injury Am J Respir Cell Mol Biol 2010; 43(6): 662-73. Bu S, Asano Y, Bujor A, Highland K, Hant F, Trojanowska M. Dihydrosphingosine 1-phosphate has a potent antifibrotic effect in scleroderma fibroblasts via normalization of phosphatase and tensin homolog levels Arthritis Rheum 2010; 62(7): 2117-6. Li C, Jiang X, Yang L, Liu X, Yue S, Li L. Involvement of sphingosine 1-phosphate (SIP)/S1P3 signaling in cholestasis-induced liver fibrosis Am J Pathol 2009; 175(4): 1464-72. Takuwa N, Ohkura S, Takashima S, et al. S1P3-mediated cardiac fibrosis in sphingosine kinase 1 transgenic mice involves reactive oxygen species Cardiovasc Res 2010; 85(3): 484-93. Swaney JS, Moreno KM, Gentile AM, Sabbadini RA, Stoller GL. Sphingosine-1-phosphate (S1P) is a novel fibrotic mediator in the eye Exp Eye Res 2008; 87(4): 367-75. Tokumura A, Carbone LD, Yoshioka Y, et al. Elevated serum levels of arachidonoyl-lysophosphatidic acid and sphingosine 1-phosphate in systemic sclerosis Int J Med Sci 2009; 6(4): 168-76. Ikeda H, Ohkawa R, Watanabe N, et al. Plasma concentration of bioactive lipid mediator sphingosine 1-phosphate is reduced in patients with chronic hepatitis C Clin Chim Acta 2010; 411(9-10): 765-0. Carter HE, Glick FJ, Norris WP, Phillips GE. Biochemistry of the sphingolipides: III. Structure of sphingosine J Biol Chem 1947; 170(1): 285-94. Pruett ST, Bushnev A, Hagedorn K, et al. Biodiversity of sphingoid bases ("sphingosines") and related amino alcohols J Lipid Res 2008; 49(8): 1621-39. Brindley DN. Lipid phosphate phosphatases and related proteins: signaling functions in development, cell division, and cancer J Cell Biochem 2004; 92(5): 900-12. Selman M, King TE, Pardo A. Idiopathic pulmonary fibrosis: prevailing and evolving hypotheses about its pathogenesis and implications for therapy Ann Intern Med 2001; 134(2): 136-51. Hunninghake GW, Schwarz MI. Does current knowledge explain the pathogenesis of idiopathic pulmonary fibrosis? A perspective Proc Am Thorac Soc 2007; 4(5): 449-52. Selman M, Pardo A. Role of epithelial cells in idiopathic pulmonary fibrosis: from innocent targets to serial killers Proc Am Thorac Soc 2006; 3(4): 364-72. Gharaee-Kermani M, Hu B, Phan SH, Gyetko MR. Recent advances in molecular targets and treatment of idiopathic pulmonary fibrosis: focus on TGFbeta signaling and the myofibroblast Curr Med Chem 2009; 16(11): 1400-7. Antoniou KM, Pataka A, Bouros D, Siafakas NM. Pathogenetic pathways and novel pharmacotherapeutic targets in idiopathic pulmonary fibrosis Pulm Pharmacol Ther 2007; 20(5): 453-61. Coward WR, Saini G, Jenkins G. The pathogenesis of idiopathic pulmonary fibrosis Ther Adv Respir Dis 2010; 4(6): 367-88. Eitzman DT, McCoy RD, Zheng X, et al. Bleomycin-induced pulmonary fibrosis in transgenic mice that either lack or overexpress the murine plasminogen activator inhibitor-1 gene J Clin Invest 1996; 97(1): 232-7. Munger JS, Huang X, Kawakatsu H, et al. The integrin alpha v beta 6 binds and activates latent TGF beta 1: a mechanism for regulating pulmonary inflammation and fibrosis Cell 1999; 96(3): 319-28. Gunther A, Lubke N, Ermert M, et al. Prevention of bleomycin-induced lung fibrosis by aerosolization of heparin or urokinase in rabbits Am J Respir Cell Mol Biol 2003; 168(11): 1358-65. Howell DC, Johns RH, Lasky JA, et al. Absence of proteinase-activated receptor-1 signaling affords protection from bleomycin-induced lung inflammation and fibrosis Am J Pathol 2005; 166(5): 1353-65. Tager AM, Kradin RL, LaCamera P, et al. Inhibition of pulmonary fibrosis by the chemokine IP-10/CXCL10 Am J Respir Cell Mol Biol 2004; 31(4): 395-404. Tager AM, Lacamera P, Shea BS, et al. The lysophosphatidic acid receptor LPA(1) links pulmonary fibrosis to lung injury by mediating fibroblast recruitment and vascular leak Nat Med 2008; 14(1): 45-54. Oga T, Matsuoka T, Yao C, et al. Prostaglandin F(2alpha) receptor signaling facilitates bleomycin-induced pulmonary fibrosis independently of transforming growth factor-beta Nat Med 2009; 15(12): 1426-30. Lee MJ, Thangada S, Claffey KP, et al. Vascular endothelial cell adherens junction assembly and morphogenesis induced by sphingosine-1-phosphate Cell 1999; 99(3): 301-12. Argraves KM, Gazzolo PJ, Groh EM, et al. High density lipoprotein-associated sphingosine 1-phosphate promotes endothelial barrier function J Biol Chem 2008; 283(36): 25074-81. Sanchez T, Estrada-Hernandez T, Paik JH, et al. Phosphorylation and action of the immunomodulator FTY720 inhibits vascular endothelial cell growth factor-induced vascular permeability J Biol Chem 2003; 278(47): 47281-90. Dudek SM, Camp SM, Chiang ET, et al. Pulmonary endothelial cell barrier enhancement by FTY720 does not require the S1P1 receptor Cell Signal 2007; 19(8): 1754-64. Camp SM, Bittman R, Chiang ET, et al. Synthetic analogues of FTY720 differentially regulate pulmonary vascular permeability in vivo and in vitro J Pharmacol Exp Ther 2009; 331: 54-64. Tauseef M, Kini V, Knezevic N, et al. Activation of sphingosine kinase-1 reverses the increase in lung vascular permeability through sphingosine-1-phosphate receptor signaling in endothelial cells Circ Res 2008; 103(10): 1164-72. Wadgaonkar R, Patel V, Grinkina N, et al. Differential regulation of sphingosine kinases 1 and 2 in lung injury Am J Physiol 2009; 296(4): L603-13. Camerer E, Regard JB, Cornelissen I, et al. Sphingosine-1-phosphate in the plasma compartment regulates basal and inflammation-induced vascular leak in mice J Clin Invest 2009; 119(7): 1871-9. Sanna MG, Wang SK, Gonzalez-Cabrera PJ, et al. Enhancement of capillary leakage and restoration of lymphocyte egress by a chiral S1P1 antagonist in vivo Nat Chem Biol 2006; 2(8): 434-1. Peng X, Hassoun PM, Sammani S, et al. Protective effects of sphingosine 1-phosphate in murine endotoxin-induced inflammatory lung injury Am J Respir Crit Care Med 2004; 169(11): 1245-51. McVerry BJ, Peng X, Hassoun PM, Sammani S, Simon BA, Garcia JG. Sphingosine 1-phosphate reduces vascular leak in murine and canine models of acute lung injury Am J Respir Crit Care Med 2004; 170(9): 987-3. Awad AS, Ye H, Huang L, et al. Selective sphingosine 1-phosphate 1 receptor activation reduces ischemia-reperfusion injury in mouse kidney Am J Physiol Renal Physiol 2006; 290(6): F1516-24. Okazaki M, Kreisel F, Richardson SB, et al. Sphingosine 1-phosphate inhibits ischemia reperfusion injury following experimental lung transplantation Am J Transplant 2007; 7(4): 751-8. Szczepaniak WS, Zhang Y, Hagerty S, et al. Sphingosine 1-phosphate rescues canine LPS-induced acute lung injury and alters systemic inflammatory cytokine production in vivo Transl Res 2008; 152(5): 213-4. Liu HB, Cui NQ, Wang Q, Li DH, Xue XP. Sphingosine-1-phosphate and its analogue FTY720 diminish acute pulmonary injury in rats with acute necrotizing pancreatitis Pancreas 2008; 36(3): e10-5. Martin P. Wound healing--aiming for perfect skin regeneration Science 1997; 276(5309): 75-81. Singer AJ, Clark RA. Cutaneous wound healing N Engl J Med 1999; 341(10): 738-46. Mogulkoc N, Brutsche MH, Bishop PW, et al. Pulmonary (99m)Tc-DTPA aerosol clearance and survival in usual interstitial pneumonia (UIP) Thorax 2001; 56(12): 916-23. McKeown S, Richter AG, O'Kane C, McAuley DF, Thickett DR. MMP expression and abnormal lung permeability are important determinants of outcome in IPF Eur Respir J 2009; 33(1): 77-84. Olman MA, Mackman N, Gladson CL, Moser KM, Loskutoff DJ. Changes in procoagulant and fibrinolytic gene expression during bleomycin-induced lung injury in the mouse J Clin Invest 1995; 96(3): 1621-30. Olman MA, Simmons WL, Pollman DJ, et al. Polymerization of fibrinogen in murine bleomycin-induced lung injury Am J Physiol 1996; 271(4 Pt 1): L519-26. Imokawa S, Sato A, Hayakawa H, Kotani M, Urano T, Takada A. Tissue factor expression and fibrin deposition in the lungs of patients with idiopathic pulmonary fibrosis and systemic sclerosis Am J Respir Crit Care Med 1997; 156(2 Pt 1): 631-. Hattori N, Degen JL, Sisson TH, et al. Bleomycin-induced pulmonary fibrosis in fibrinogen-null mice J Clin Invest 2000; 106(11): 1341-50. Howell DC, Goldsack NR, Marshall RP, et al. Direct thrombin inhibition reduces lung collagen, accumulation, and connective tissue growth factor mRNA levels in bleomycin-induced pulmonary fibrosis Am J Pathol 2001; 159(4): 1383-95. Scotton CJ, Krupiczojc MA, Konigshoff M, et al. Increased local expression of coagulation factor X contributes to the fibrotic response in human and murine lung injury J Clin Invest 2009; 119(9): 2550-63. Idell S. Coagulation, fibrinolysis, and fibrin deposition in acute lung injury Crit Care Med 2003; 31(4 Suppl): S213-20. Chambers RC, Laurent GJ. Coagulation cascade proteases and tissue fibrosis Biochem Soc Trans 2002; 30(2): 194-200. Kim KK, Kugler MC, Wolters PJ, et al. Alveolar epithelial cell mesenchymal transition develops in vivo during pulmonary fibrosis and is regulated by the extracellular matrix Proc Nat Acad Sci USA 2006; 103(35): 13180-5. Loskutoff DJ, Quigley JP. PAI-1, fibrosis, and the elusive provisional fibrin matrix J Clin Invest 2000; 106(12): 3. Ploplis VA, Wilberding J, McLennan L, et al. A total fibrinogen deficiency is compatible with the development of pulmonary fibrosis in mice Am J Pathol 2000; 157(3): 703-8. Jenkins RG, Su X, Su G, et al. Ligation of protease-activated receptor 1 enhances alpha(v)beta6 integrin-dependent TGF-beta activation and promotes acute lung injury J Clin Invest 2006; 116(6): 1606-4. Sanchez T, Thangada S, Wu MT, et al. PTEN as an effector in the signaling of antimigratory G protein-coupled receptor Proc Natl Acad Sci USA 2005; 102(12): 4312-7. Long JS, Natarajan V, Tigyi G, Pyne S, Pyne NJ. The functional PDGFbeta receptor-S1P1 receptor signaling complex is involved in regulating migration of mouse embryonic fibroblasts in response to platelet derived growth factor Prostaglandins Other Lipid Mediat 2006; 80(1-2): 74-80. Hashimoto M, Wang X, Mao L, et al. Sphingosine 1-phosphate potentiates human lung fibroblast chemotaxis through the S1P2 receptor Am J Respir Cell Mol Biol 2008; 39(3): 356-63. Donati C, Cencetti F, Nincheri P, et al. Sphingosine 1-phosphate mediates proliferation and survival of mesoangioblasts Stem Cells 2007; 25(7): 1713-9. Schnitzer SE, Weigert A, Zhou J, Brune B. Hypoxia enhances sphingosine kinase 2 activity and provokes sphingosine-1-phosphate-mediated chemoresistance in A549 lung cancer cells Mol Cancer Res 2009; 7(3): 393-401. Thannickal VJ, Horowitz JC. Evolving concepts of apoptosis in idiopathic pulmonary fibrosis Proc Am Thorac Soc 2006; 3(4): 350-6. Kono Y, Nishiuma T, Nishimura Y, et al. Sphingosine kinase 1 regulates differentiation of human and mouse lung fibroblasts mediated by TGF-beta1 Am J Respir Cell Mol Biol 2007; 37(4): 395-404. Gellings Lowe N, Swaney JS, Moreno KM, Sabbadini RA. Sphingosine-1-phosphate and sphingosine kinase are critical for transforming growth factor-beta-stimulated collagen production by cardiac fibroblasts Cardiovasc Res 2009; 82(2): 303-12. Dhami R, He X, Schuchman EH. Acid sphingomyelinase deficiency attenuates bleomycin-induced lung inflammation and fibrosis in mice Cell Physiol Biochem 2010; 26(4-5): 749-60. Varga JA, Trojanowska M. Fibrosis in systemic sclerosis Rheum Dis Clin North Am 2008; 34(1): 115-43; vii. Radeke HH, von Wenckstern H, Stoidtner K, Sauer B, Hammer S, Kleuser B. Overlapping signaling pathways of sphingosine 1-phosphate and TGF-beta in the murine Langerhans cell line XS52 J Immunol 2005; 174(5): 2778-86. Xin C, Ren S, Kleuser B, et al. Sphingosine 1-phosphate cross-activates the Smad signaling cascade and mimics transforming growth factor-beta-induced cell responses J Biol Chem 2004; 279(34): 35255-62. Sauer B, Vogler R, von Wenckstern H, et al. Involvement of Smad signaling in sphingosine 1-phosphate-mediated biological responses of keratinocytes J Biol Chem 2004; 279(37): 38471-9. Bu S, Kapanadze B, Hsu T, Trojanowska M. Opposite effects of dihydrosphingosine 1-phosphate and sphingosine 1-phosphate on transforming growth factor-beta/Smad signaling are mediated through the PTEN/PPM1A-dependent pathway J Biol Chem 2008; 283(28): 19593-602. Pattanaik D, Postlethwaite AE. A role for lysophosphatidic acid and sphingosine 1-phosphate in the pathogenesis of systemic sclerosis Discov Med 2010; 10(51): 161-7. White ES, Atrasz RG, Hu B, et al. Negative regulation of myofibroblast differentiation by PTEN (Phosphatase and Tensin Homolog Deleted on chromosome 10) Am J Respir Crit Care Med 2006; 173(1): 112-21. Ikeda H, Watanabe N, Ishii I, et al. Sphingosine 1-phosphate regulates regeneration and fibrosis after liver injury via sphingosine 1-phosphate receptor 2 J Lipid Res 2009; 50(3): 556-64. Davaille J, Gallois C, Habib A, et al. Antiproliferative properties of sphingosine 1-phosphate in human hepatic myofibroblasts. A cyclooxygenase-2 mediated pathway J Biol Chem 2000; 275(44): 34628-3. Davaille J, Li L, Mallat A, Lotersztajn S. Sphingosine 1-phosphate triggers both apoptotic and survival signals for human hepatic myofibroblasts J Biol Chem 2002; 277(40): 37323-0. Li C, Zheng S, You H, et al. Sphingosine 1-phosphate (S1P)/S1P receptors are involved in human liver fibrosis by action on hepatic myofibroblasts motility J Hepatol 2010; 54(6): 1205-3. Liu X, Yue S, Li C, Yang L, You H, Li L. Essential roles of sphingosine 1-phosphate receptor types 1 and 3 in human hepatic stellate cells motility and activation J Cell Physiol 2011; 226(9): 2370-7. Jones BE, Lo CR, Srinivasan A, Valentino KL, Czaja MJ. Ceramide induces caspase-independent apoptosis in rat hepatocytes sensitized by inhibition of RNA synthesis Hepatology 1999; 30(1): 215-22. Tsugane K, Tamiya-Koizumi K, Nagino M, Nimura Y, Yoshida S. A possible role of nuclear ceramide and sphingosine in hepatocyte apoptosis in rat liver J Hepatol 1999; 31(1): 8-17. Lang PA, Schenck M, Nicolay JP, et al. Liver cell death and anemia in Wilson disease involve acid sphingomyelinase and ceramide Nat Med 2007; 13(2): 164-70. Moles A, Tarrats N, Morales A, et al. Acidic sphingomyelinase controls hepatic stellate cell activation and in vivo liver fibrogenesis Am J Pathol 2010; 177(3): 1214-24. Caballero S, Swaney J, Moreno K, et al. Anti-sphingosine-1-phosphate monoclonal antibodies inhibit angiogenesis and subretinal fibrosis in a murine model of laser-induced choroidal neovascularization Exp Eye Res 2009; 88(3): 367-77.